Horrible to watch last night, especially when the spire fell. Felt like crying. Much has been saved, though. 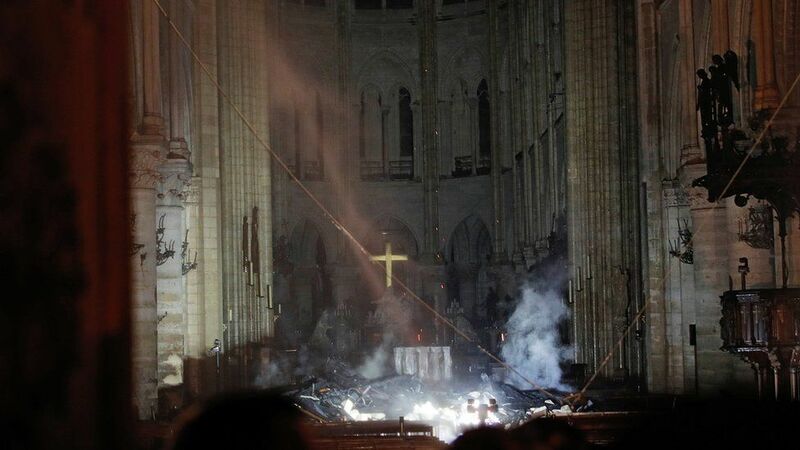 Nice quotation: one of the church officials was allowed in this morning with the pompiers, and mentioned that the glided cross and a statue of the Virgin were still standing. Interviewer: "C'est un miracle?" Official: "Le miracle, c'est les pompiers." Read last night that the builders of Notre Dame used timbers from an earlier church that was already several hundred years old, and some of its timbers had most likely been felled in the 7th and 8th centuries. Two Parisian companies, Pinault and Arnault, have promised 300 million euros between them. Image 5 in this page shows a section of the vaulted ceiling. That image makes me think that there might have been some cast-iron used in the 1840s/50s restoration of the roof. Cast Iron was used after a fire at Chartres in the 1830s. On June 4, 1836, following the carelessness of plumbers who were making repairs, a fire broke out in the roofing timbers of Chartres cathedral. The fire spread quickly, destroying the wood frame, the forest, and the cathedral's lead roof. Fortunately, the fire did not advance into the bell tower. There, the great bell was not harmed, sounding for half an hour. Many lower bells were lost, to be replaced in 1840 and 1845 by those still rung today. The roof was replaced by a beautiful iron frame and a copper roof, built in metal for future safety and for economy, like the partial roof at Southwark Cathedral, London built during the restoration of 1822-25, and the cupola at Mayence [Mainz in Germany], built in 1827 (?). When built, the span over the cathedral's crossing (where the nave crosses the transept) was the largest of any iron-framed construction in Europe. The iron frame looks like a huge boat overturned. The framing has joists of wrought and cast iron, connected by rafters that ensure the rigidity of the structure. The fabric of churches built before 1905 is owned by the state in France, and they've been pretty unsentimental about originality in reconstruction in the past. The reference to 'plumbers' refers to working with lead, the roof cladding. Chap on the radio this morning was saying that the timber roof structure equated to 1400no oak trees! Bound to be oak forests. Europe has a vast quantity of high grade standing oak which would be suitable. They would have to do some large scale structural repairs if they were going to use oak, as it would be extremely heavy in its green state. On reflection, the visible metal is probably the scaffolding. The beams to repair the roof will be sourced widely. One of the Woodland Trust woods that Heather looks after provided some for the York Minster restoration, that was before WT owned it. Although large parts of Miltonrigg Woods and the adjoining Folly Wood are ancient in origin, many of the trees seen today have been planted. Both woods are dominated by oak and beech, with pockets of birch, ash and sycamore which were planted around 1890. Subsequently areas have been intermittently felled and planted with conifers such as European large, Scots pine and Norway spruce between 1945 – 1984. The woodland also contains some magnificent older trees of such quality that some were used in the rebuilding of part of the roof of York Minster in 1984 following a catastrophic fire. Seems the picture today is not quite as bad as was feared last night. If it's a wet spring and summer, the rain will continue the damage. It's not as if you can just string a tarp over it. Indeed, and there is the small matter of the seriously damaged scaffolding that will need to be dealt with. And the limestone vaulting which had the fire sitting on it could have been turned into quicklime from the heat. The building fabric is far from saved. Indeed, taking that down's going to be like a giant game of Jenga. The Al-Aksa mosque in Jerusalem was also on fire last night. The Prayer Room of the Marwani Guards and Solomon's Stables have been destroyed. Two hurricanes came through France in 1999 and a lot of timber either fell or had to be felled afterwards. The timber yards are still full of seasoned wood. At least one timber merchant has said he'll donate as much wood as they want. That's good, because Macron wants it all fixed and finished in 5 years. He obviously hasn't met any building conservators, there will be a 5 year argument about the best way to do it and what type of wood to use. My nephew and his colleagues at Salisbury Cathedral may be some of the experts seconded for the rebuilding. There's an international shortage of qualified and experienced cathedral stonemasons. Given that Notre Dame is such a tourist magnet and earner for Paris and France (it gets more than twice as many visitors than the Tower of London, St Paul's and Westminster Abbey combined) and the building is actually owned by the state it's a bit of a cheek that, other than a minimal amount from the Culture Department, the Archdiocese of Paris is expected pay for its upkeep. The whole 'separation' of church and state thing is a bit of a grey area in France. Church and State aren't separated in part of France. The Concordat in Alsace-Moselle is the part of the Local law in Alsace-Moselle relating to the official status accorded to certain religions in these territories. This Concordat is a remnant of the Napoleonic Concordat of 1801. The 1801 Concordat was abrogated in the rest of France by the law of 1905 on the separation of church and state. However, at the time, Alsace-Moselle had been annexed by Germany, so the Concordat remained in force in these areas. The Concordat recognises four religious traditions in Alsace-Moselle: three branches of Christianity (Catholic, Lutheran and Reformed) plus the Jewish religion. Therefore, the French concept of laïcité, a rigid separation of church and state, does not apply in this region. I treasure these little oddities. The image of a monolithic France is contradicted by the realities on the ground. Edit, a search puts the government contribution to maintenance at €2.3 million per annum. Though the French government currently spends two million euros ($2.3 million) a year for maintenance work, the conservation to-do list had grown long.